Great Fishing Weather, What a Relief..! *on these trips we include the special temporary Non-Resident license. Our normal rates for the Smith are Half Day (1) Angler $150, (2) Anglers $195, and Full Day (1) Angler $195, (2) Anglers $235.00. Add in a free out of state non-resident license and you have one heck of a deal. Most of our Smith River trips we’ll depart really early in the morning because there’s a good terrestrial bite early in the am hours. Then as the day progresses we fish our way downstream usually covering lots of water over the course of the day. Many folks are unaware that brown trout exist all the way down to and past Martinsville, VA, and that Special trout regs exist for both browns (all fish between 10 and 24 inches must be released) and rainbows (fish less than 7″ must be released) all the way down to the NC/VA line just south of Ridgeway, VA. Smallmouth mix in as you leave Martinsville, along with some redeyes and redbreast sunfish. A great way to beat the summer heat as the Smith runs a chilly 46-48F from the dam even in the hottest part of the summer, and that is why the river is often shrouded in fog for the first 4 -5 hours of daylight…. its also a good river once you learn how to fish it…… Let’s Go Fishing! New Week, Cooler Temps a Plus…. Mon. July 30, 2012….Had a couple of days at the end of last week where I didn’t post a daily report, so this one is a bit longer than usual. Here goes…! Guided Ryan Sexton, Matthews, NC, when I met Ryan bright and early in N. Wilkesboro I knew we were in for a scorcher….and sure enough it was as advertised by the weather folks. 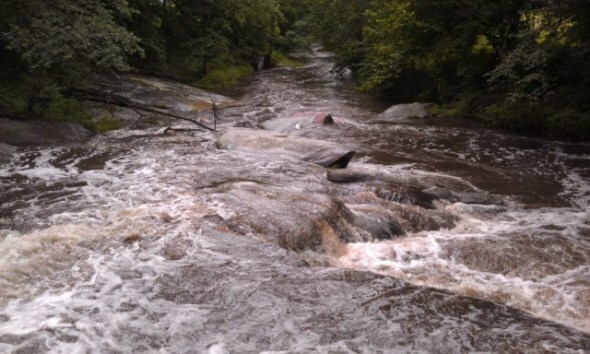 We drove along the lower river and much to my surprise it was muddy….a rarity on the Soho. It was muddy along 2/3 to 3/4 of its entire length. We arrived upstream above the muddy water and from the beginning the fish were on. It didn’t take long for Ryan to score, within minutes the first fish was in the net. We fished to sippers with a dry /dropper rig and did very well through noon, nailing about 20 fish on the dry /dropper combo and then several on a sulphur high post pattern #18 I have been using on these tough fish. We caught a number of fish, including the best fish of the day, a 15-16″ brown on the high post. We then moved up river, as there were few rising fish, and covered a couple of flats. We got one fish that gave a slashing, smashing strike on a beetle, about a 15″ brown, then we moved to the flats just upstream. Ryan landed about 4 or 5 more there. In one spot we were walking and I noticed a brown of about 27-28″ long swimming right at us….like he was totally unaware of our presence. I knew something must be wrong with it. I netted the beast without much protest, and upon inspecting it saw a piece of large monofilament line trailing out of its rear end. The fish had obviously ingested a bait fishing rig and was in the process of dying. It was a huge male brown, probably 8-9lbs…a true trophy. We left it to let nature take its course. We then headed downstream and hit another hole. Ryan nailed about six or 8 more fish there as we nymph fished a deep hole I knew would be fishing well with the cloudy water. We killed them on choco midges, even in the dirty water. We walked back to the SUV and had a late lunch, then headed upstream to hopefully catch the sulphurs coming off. With the release schedules of the past week the river temps even up as far as the Beidleman access and Hickory Tree and Big Springs areas are running in the middle to high 60s, that’s high for the SoHo. Means early fishing is good, midday is slow, late afternoon picks back up in the upper river with the final pulse of the day. We went upstream and sure enough the hatch was underway. The fish were as tough as nails….a common thing with these smaller sulphurs that are a size 18/19. We fished to rising fish for the last hour and a half and nailed 4 more fish, bringing Ryan’s catch on the day to 34. Not bad for a first trip to the SoHo…..really, not bad for any trip to this great river. We called it a day, headed back to take our gear off and get an ice cold drink, then we headed home. Great day, Ryan did a great job and should be proud. Here are some pictures of our day, you can view the Entire Trip Photo Album here . Ryan Sexton with one of 34 fish on the day on our SoHo trip on Thursday of last week. Guided Albert Lundquist, Summerfield, NC, on Saturday, met Albert very early and we headed north to my home water, the Smith R. After a quick steak biscuit and coffee, we were geared up and in the river fishing. 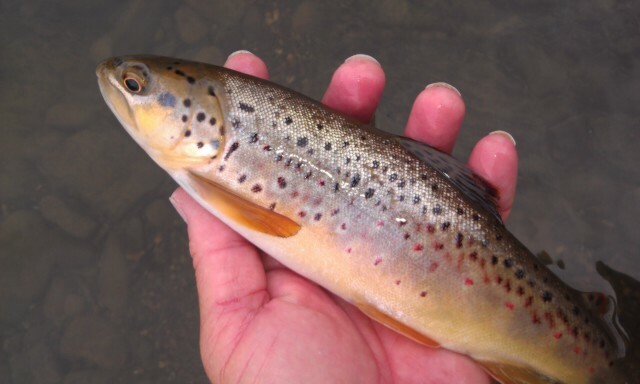 We got two decent browns in the first few minutes of fishing, both of them took a choco midge. We worked our way upriver, missed a couple of fish, casted to a pod of nice risers but they were tough. They were in one of the toughest spots on the river and with the sun finally getting above the trees the fish were quite spooky. We went back to the SUV and went upriver to another spot where we quickly were into several more fish, all of these rainbows, including several we missed as well. 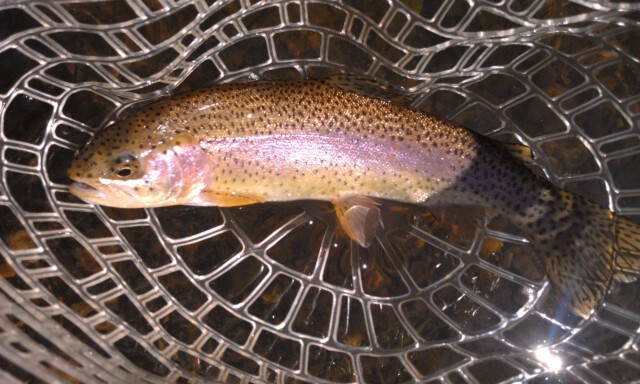 The last fish, a nice 16″ rainbow, took a dry /dropper rig, a #20 choco midge fished under a RC Caddis dry fly. By then it was lunch time and pretty hot, Albert and I had lunch and then headed back. The Smith has continued to fish pretty well even in the summer heat. We are offering a Late Summer Terrestrial Special on these trips, a full day or half day where you can learn techniques that will improve your skills on any water…. Have some great deals on used fly rods, you can check them out on our Used Equipment page here . 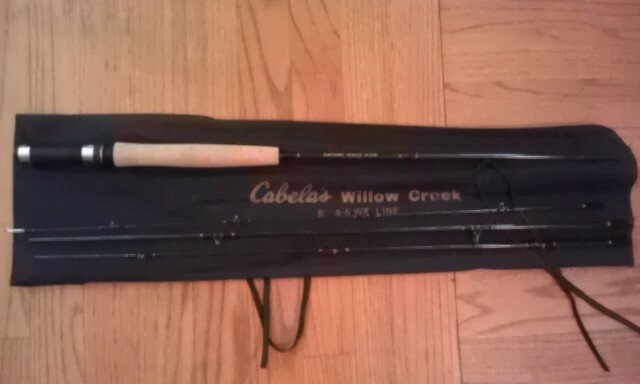 One rod in particular is a Cabela’s Willow Creek rod that is 8 feet and 4 pieces and is a 4/5 which means you can fish either line on it. Comes with the rod and a rod sack. This is a great deal for a beginner or a backup rod for travel as well. At 8 feet and 4/5 its the most versatile size—– like a 9 iron would be to golf—– you could use. Its great for panfish, trout, bass and other fish in ponds/lakes. This one won’t last. I also have a GLoomis GL 3 two piece 8wt that is like a new rod, and a GLoomis FR1084 IMX 9ft 4 Wt….also pratically a brand new rod. 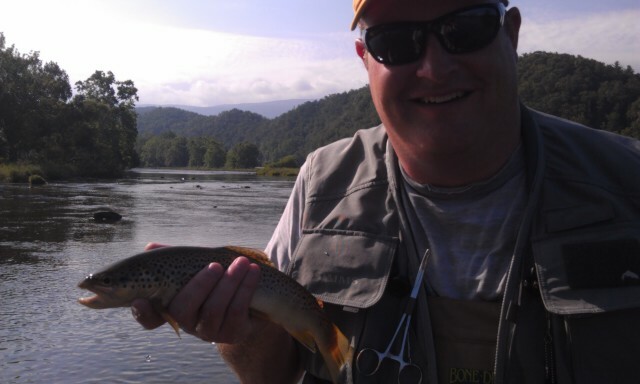 One of the best rods for the tailwaters like the Smith R, South Holston, Watauga…..that you could ever pick. Also have a Fenwick World Class Reel 7/8 weight, with an extra spool, each spool is rigged with line and backing….. and one last one, is a G Loomis GL3 model 1417 reel with a floating fly line….. You can check out or bid on these items on eBay here . They won’t last long! The rod above is a cool stick, I have looked it over well and its practically brand new with no signs I can tell that its ever been fished…handle is in grade A condition which is the easiest way to tell how much a rod has been used. 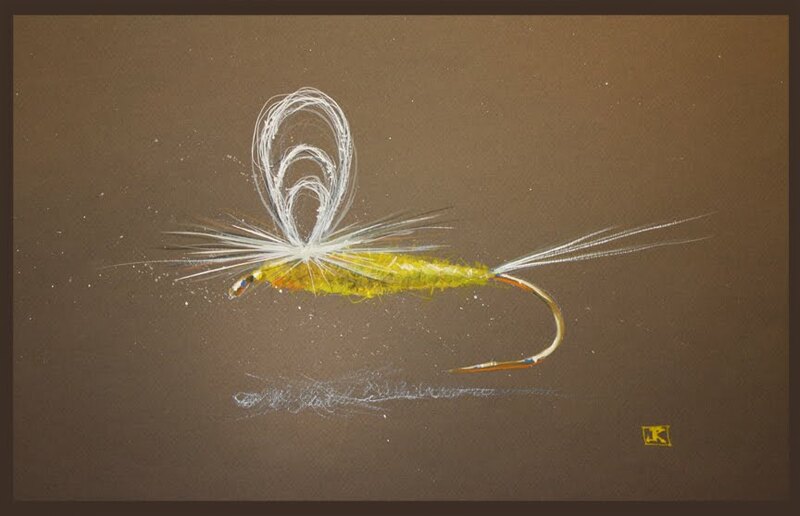 If interested you can shoot me an email at jwflyfishing@gmail.com. This one will be gone soon! I have a lot of really nice used rods coming in in a few days and will be posting more this week as well. Hope your week is off to a great start, I will be on the water several days this week, some tailwaters trips, some fishing high elevation native waters, and also some smallmouth bass trips. Should be a great week, and a lot more comfortable to be outside whether here or in our Mountains. we arrived to a warm, muggy morning on the river, I met the guys at Prices near the river and we headed upstream where we were going to fish for the first half of the day. We got in the river, the air was its usual warm and muggy but interestingly the fog wasn’t as thick as it can be. We stuck a few fish early on beetles, but then quickly switched to dry /dropper rigs to effectively cover all the fish we could see cruising. This would prove to be a fruitful move, we started catching fish right away on a variety of small nymphs/midges….pumpkins, choco midges, glass bead zebras, and split cases….anything small and dark. We nailed a number of nice browns and rainbows, I’d guess that Hugh had the high total with about a dozen to 15 fish til lunch, Donal and Neil each maybe a half dozen to eight fish each. I was watching a storm on radar and it was bearing down on us….we fished through the midday pulse and to my surprise we got no sulphurs and almost no rising fish either during it… so we caught a couple more fish and then headed back to the SUVs for a lunch break. After lunch we headed to another spot, within minutes large bolts of lightning and several loud claps of thunder forced us to take cover on the river bank and wait it out. Wind, thunder and lightning….very intense I might add….and some brief, heavy rain , we waited probably a half hour until the storm passed. We got in and started hitting some likely spots with beetles and caught several really nice fish right off the bat. Donal scored first with a couple nice browns, then Hugh followed suit. I walked Neil upstream to a good spot and he quickly nailed about 10-12 decent fish. Donal nailed another nice fish or two and so did Hugh, then another fast moving thunderstorm moved on top of us quickly and soon we were again running for cover on the streambank. This one didn’t have as much thunder and lightning but the rain was very heavy. Brief, but very heavy. I noticed that the river was rising and getting dirty, obviously from upstream runoff from a couple of upstream tribs to the main river. We got back in, I rigged Donal’s rod up with a nymph rig and a couple flashy nymph patterns and he nailed about 4 or 5 nice fish in short order. After about an hour, the water got so muddy on the side we were fishing we were forced to fish the other side. 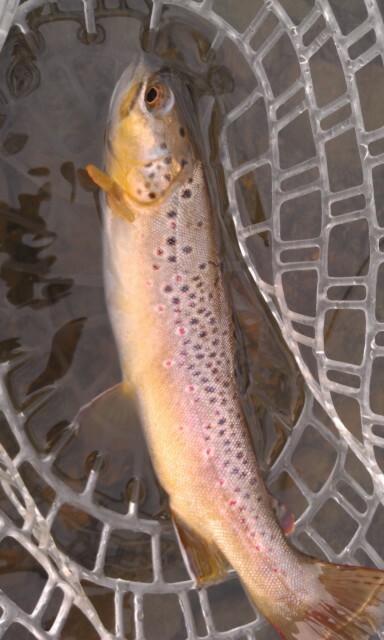 We worked our way back downstream on the way toward the cars and Hugh caught one more nice brown on a beetle, Donal caught 2 more browns on a black ant, and Neil had the big fish of the day, a 17.5″ brown that mashed one of my SoHo Skinny Hoppers in Tan. Neil landed 3 more rainbows as we got to a spot where there were some fish rising to what was becoming a fair little sulphur flurry….these were #18 dorothea sulphurs, the smallish,pale yellow/orange ones that the fish are maddenly selective to and fussy to catch. Neil did a great job nailing 3 of these fish on totally flat, slick water…..a feat on any river and especially on this river. With that and with the muddy water quickly spreading all over we decided to pack it in and call it a day. Great day, great guys…I didn’t keep an accurate count of fish but I’d say between 12 and 20 fish each give or take a few…it was a good day even if we did have to work for them… Great day though, and as I said great guys….I have the best clients on earth. These guys were phenomenal, could cast really well, and were an absolute pleasure to spend a day with. Things aren’t quite as stormy today as they have been, looks like warm and muggy will continue though with daily afternoon storm chances…but hey, its summer and that is normal. Will be guiding Ryan Sexton of Matthews, NC, tomorrow and we will be fishing the South Holston and maybe one other place as well. Looking forward to a great day. Tues July 24, 2012…Heading past the north rim of South Holston Lake and what a calm, muggy morning it is. Headed out to meet my clients for the day, Donal Ratigan, and his two sons, they are from Atlanta, GA. Hopefully we can get into some good dry fly fishing. Tues. July 17,2012….Today has been one of those days that if I truly state how good the fishing has been it will sound like a lie. Guiding Lynn Roloff on the SoHo and we have had one of the most incredible mornings of beetle fishing I have ever witnessed. 20 browns to 16" , all in beetles and all before 10am. We worked our way upriver stalking and casting to sippers and have tallied another 15 fish, bringing our total to over 30 before lunch…..35 to be exact. Really incredible….we are heading to another spot then onto lunch. 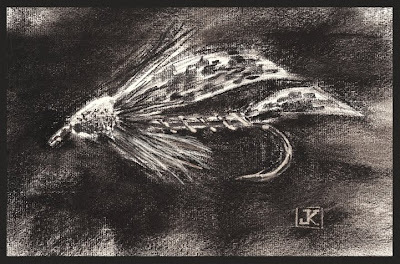 Tues. July 17, 2012….Been saying it for days….the beetle and terrestrial action in general is great, guiding Lynn Roloff and we have landed several nice browns on one of my Jap beetles. Fish rising like mad , going to be a great day……its unreal. Top of the Morning to You…. Mon. July 16, 2012….And a humid one indeed. Out early this morning and its really sticky. Makes me think of all the beetles that are out and about. After many summers in a row without very many and some lackluster fishing here with them…..prime beetle time is here again. I have been up since 4am getting an early start on filling up my trip boxes. And beetles are one of the things I have been tying. Things are pretty wet in the mountains, daily rains—-some on the heavy side—have kept waters up and murky/muddy as the ground is saturated. 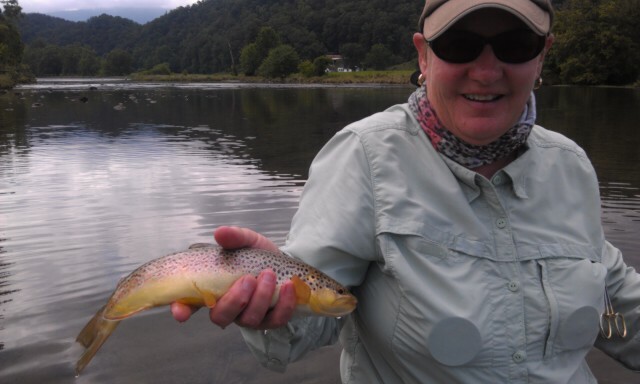 I will be doing a guided trip with Lynn Roloff of Greensboro, NC , and we will be on the South Holston. Some terrestrial fishing is what we will be doing….and it should be very good …. Will be working on getting out our next newsletter as well as some fly and gear specials and some customer requested fly tying materials and mini kits for beetles, ants, and a neat strike indicator fly. Another Steamy, Wet Day in Paradise….. Sat. July 14, 2012…. That pretty much summed up today, I took out two flyfishing class students Dan Mara, Ron Morris,Greensboro, NC, NC Mtns. It was already tough conditions before we arrived, the guys were only able to do today with their schedules so we gave fishing a try. Several places were blown out, with the combination of rain that had already fallen, a saturated ground, and tons of heavy rain that was to come. If it wasn’t high, dirty water, it was heavy rain. That was today’s theme. 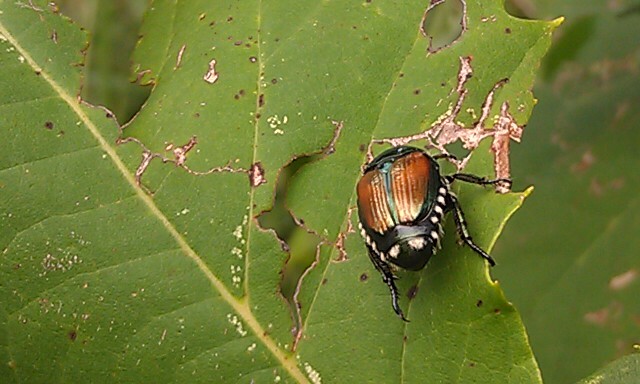 A shame, as the terrestrial fishing is in full force, and its been a while since I have seen so many beetles. And the beetle fishing has been pretty good as it normally is when we have a hot, steamy summer as we have had the past month or two. Today was a tough fishing day, a real challenge…..an impossible proposition. We packed it in mid-afternoon when the last thunderstorm came…and that was the final straw. An unbelievable downpour. I have a busy week ahead with several guided trips so looking forward to getting on some better water conditions as this current weather pattern we are in should change up a little. Still warm with the chance of afternoon showers/thunderstorms just not the very widespread heavy rains of late. 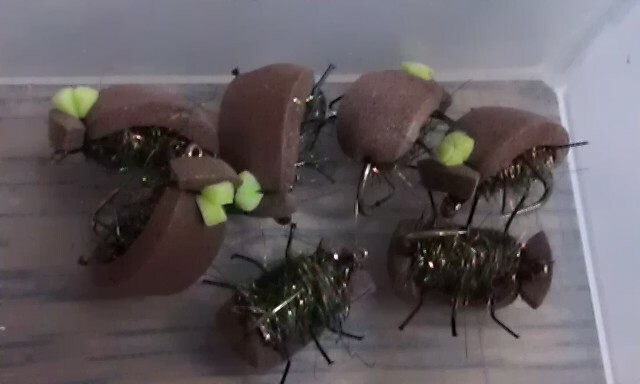 I have some fly specials coming up, one of which is a killer terrestrial fly sampler. Will have more on that to come. Have a great remainder of the weekend. Sat. July 14, 2012…….Headed out today looks like a steamy day ahead with highs near 90F. Headed out to the mtns this morning guiding Dan Mara of Greensboro, NC. Hope we can find clear water…. Thurs. 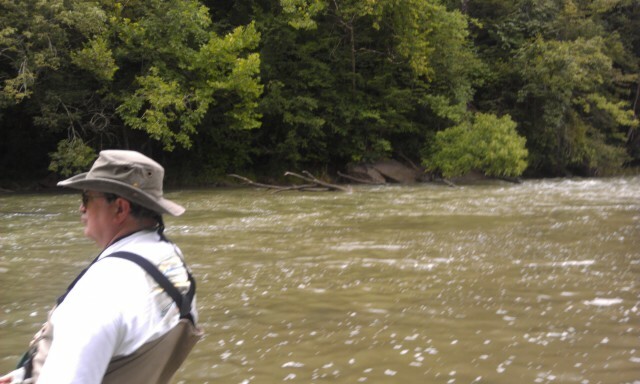 July 12,2012…Great day guiding Dr Pat Burney, we have had an awesome day on the South Holston. The river is half muddy, we fished the murk with a couple of my dirty water nymph patterns and have done really well. Caught about 35 fish so far, including a dozen or so on dries. Sulphurs and blue winged olives, and bwo spinners have brought fish to the top. It’s been great….sometimes it can be like that if you know where to focus your efforts. We are heading to lunch and another spot.